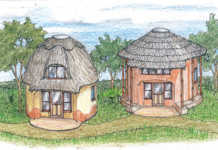 Jonno assists Jeremy with a design for a far-style house in Swaziland. 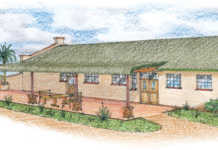 I really enjoy looking at your house designs in Farmer’s Weekly. As a first-time builder it is rather difficult putting all one’s ideas into a plan that works. 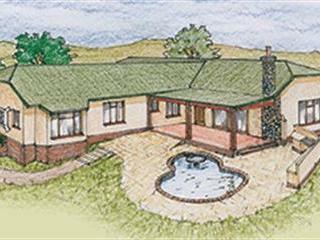 We have just bought a 4 500m² plot on a small residential estate in Swaziland where the general building requirement is farm-style/big verandas. Our plot is at the back of the estate with a fair gradient. It is narrow at the entrance and then widens slightly. Our plan is to level the wider section to create a platform to build on. As it is quite elevated, we would not need to go double storey, but we are not against this idea. We require a large veranda/entertainment area leading onto a pool and inside we would like three or four bedrooms, and a scullery, laundry and pantry. For security reasons we would like the bedrooms on one side of the house and they must be locked off from the rest of the house. We really enjoy entertaining and cooking so we would like an open-plan idea. One thought we did have was a sort of T-shape style with the living/garage area being at the top of the T and then the stem would be the sleeping accommodation. Any ideas and help will be much appreciated. views and sun orientation into consideration. The dotted lines shown in the garage is where an attic can be accommodated in the roof area. 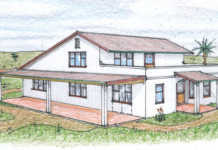 When we get started on the working drawing; you can email me a photograph of the site where you will be positioning the house. Also feel free to make any preferred changes to room sizes and the styling with your residential estate committee.